Digital sales are soaring despite rivals' attempts to slow Wayfair down. 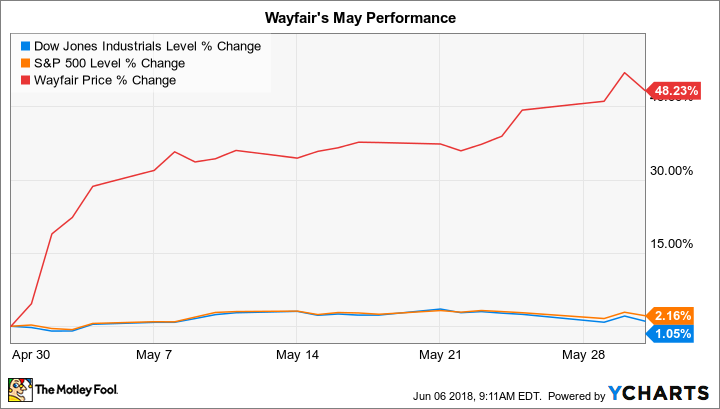 E-commerce specialist Wayfair (NYSE:W) shot up by 48% last month compared to a 2% increase in the S&P 500, according to data provided by S&P Global Market Intelligence. The rally pushed the volatile stock to a new record, with the home-furnishings marketer more than doubling since early 2017. May's spike came in response to impressive quarterly earnings results. Rather than slowing down, as management had projected, sales growth held steady at a market-crushing 48% pace in the fiscal first quarter as Wayfair extended its base of loyal customers to nearly 12 million. The company protected its profitability, too, despite ramped-up price-based competition from rivals like Overstock. Wayfair remains unprofitable, and investors shouldn't expect a big change on that score. Management is pouring investments into its international expansion, after all, so that business segment is producing significant losses right now. The more mature U.S. market is operating at just below breakeven, meanwhile. But investors are choosing to focus instead on the fact that Wayfair is consolidating its hold over the fragmented home-furnishings industry. The company's success at growing, despite competitive attacks, combined with its strengthening delivery network and rising customer base all suggest that this growth story just might be getting started.